Using its specially developed Electrification Piling Train (EPT), the SB Rail team drove a total of 944 piles on this project. Varying in length from 3.5 meters to 8.0 meters, the piles are needed as foundations for electrification structures on the route. 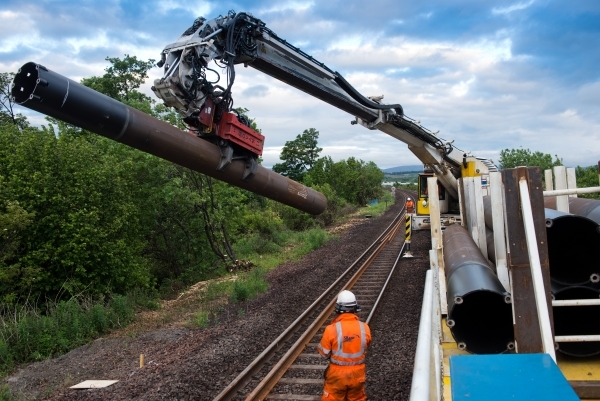 Towards the end of the programme SB Rail were challenged to install 55 of the longest 8.0 meter long piles types. This was a first for single section piles of this length and only believed possible using SB Rail’s specialist equipment. Using conventional methods the longest piles would have needed to be installed as splices, bolting two 4.0 meter sections together, increasing installation time and exposure of site personnel to additional hazards during the bolting activity.